A showcase of all 8 Sheltie colors, with coats of sable, tri color, bi black, blue merle, bi blue, color headed whites, and white factored Shelties. Check out our pictures of these beautiful coat colors and their intriguing genetic causes. The Sheltie colors come in three broad strokes: sable, black, and blue merle. 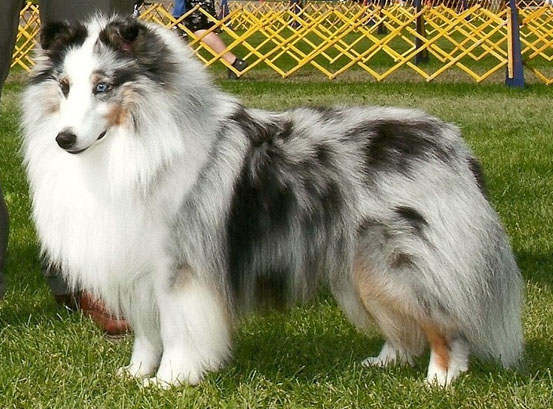 Within these categories, Shetland Sheepdog colors offer varying amounts of tan, mahongany, black, gray and white, to make a variety of beautiful combinations - officially known as sable, tri color, bi black, blue merle and bi blue. Head spinning? The variations (not to mention the genetics) can get complicated, so I've broken them all down here to give a good insight into the overall look, the breed standard and the genetics of Sheltie colors. The classic Sheltie, sables range from light gold to mahogany. As you can see in this mahogany Sheltie example, the tan coloring can also be overlaid with flashes of black. Traditional tan sables might have no black at all. 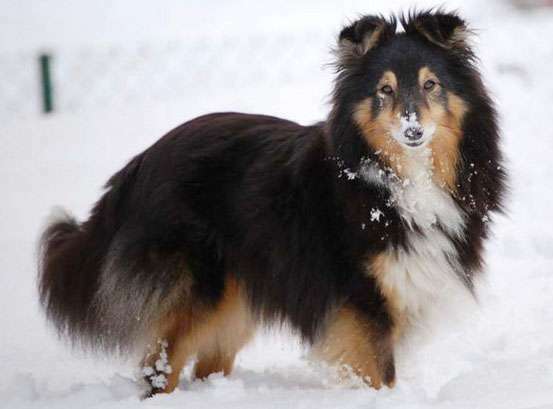 Sable Shelties feature patches of white around the neck, chest, legs, and toes in what's called an "Irish" patten, common to all the Sheltie coats. 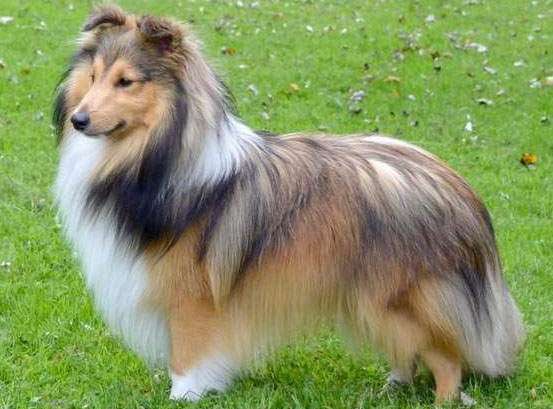 The sable Sheltie color arises from a dominant allele (gene variant). This dominance makes it the most common coat color among Shelties. Curiously, sable Sheltie puppies are born with subtle hues which deepen and intensify with the development of the double coat. The sable color may develop further as the dog matures - as does the thickness and quality of the double coat. Sables can range through many shades of golden through mahogany, but washed-out colors or brindle (striped) markings are considered faults. Conspicuous white body spots (other than the normal distribution of white on the chest and legs) also lose points. Shelties with more than 50 percent white fur are disqualified. Yep, dog standards are pretty strict, and they need to be because that's how breeders maintain the specific look of the Shetland Sheepdog breed. Bi black Shelties comprise of solid black hairs which make up most of the coloring, alongside Irish patches of white fur. Bi black Shelties are so named for their black-and-white mixture, where bi is Latin for two. They fall under the umbrella term of black Shelties. 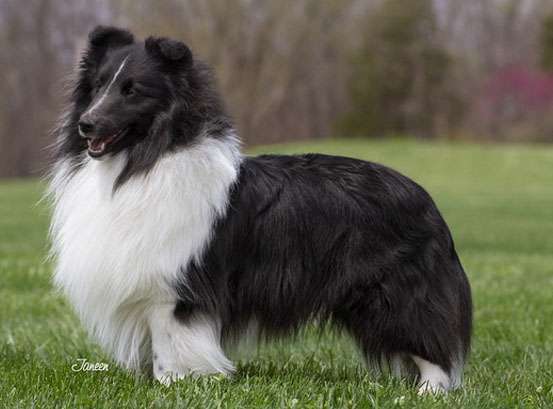 The bi black Sheltie allele is recessive, which makes it the least common type of Sheltie color. Interestingly, the opposite is true in many other dog breeds, where black is the dominant allele. To produce bi black puppies, breeders either need one or both parents to be bi black too. That said, breeding two tri colors (see below) can also produce a few bi black puppies if both parents are carriers of the recessive black allele. Solid black-and-white fur is expected, while rustiness or fading in the black fur is seen as a fault. Bi black Shelties with more than 50 percent white fur are disqualified. Tri color Shelties are a gorgeous combination of black, white and tan. They fall under the black Sheltie category too. As per the Irish pattern, the white fur appears on the chest and legs. The tan fur is usually found on the cheeks, throat, ears, eyes, legs and under the tail. You'll see a few more tri color Shelties around thanks to their genetics: tri color is recessive to sable, but dominant to bi black. Shelties with both sable and tri color alleles are known as "tri factored" and can pass on either coat color to their puppies. Here are the most likely outcomes of crossing coat colors of different parents. This is simplified for clarity - for example, breeding two bi factored tri colored Shelties can produce bi black offspring, but this less common possibility is not shown here. Tri color Shelties should feature distinctive blocks of each color, with the tan shades ranging from golden through mahogany. Conspicuous white body spots (other than the normal distribution of white) are faults, as are washed-out of degenerate colors. Look at this handsome devil. Blue merle Shelties could be considered tri color Shelties with color modifications (see genetics below). This creates a coat in which the black hairs are diluted into various shades of gray-blue. There's also the white and tan dsitribution of a regular tri color. Unlike the Sheltie colors seen so far, merle Shelties are not produced by color genes. Instead, they are created by a color modifier gene which affects the base color of the dog (black or sable). The same modifier gene can also give the dog either one or two blue eyes. Breeding two blue merles has a 1 in 4 chance of creating a double merle - and this has serious health consequences. While it results in a stunning all-white coat, the lack of melanin drastically impacts development of the eyes in the womb. Many double merles are born blind, or deaf, or both. Judges deduct points for rustiness in a blue merle coat, as well as faded or washed-out colors. Self-color (without any merling or mottling, appearing as a faded or diluted tri color) is also a fault. As we've seen earlier, Shelties with more than 50 percent white are exclulded from competition, and this includeds double merles. Bi blue Shelties have only blue merle and white colors (ie - no tan). Like the other Sheltie colors, the overall pattern is Irish with a white chest and legs. They have varying degrees of mottling, and the eye color can be blue or merled. 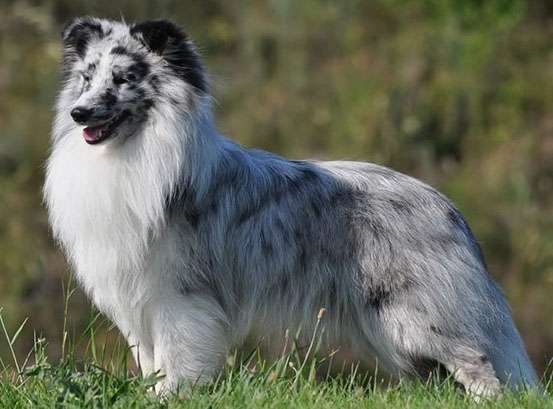 A bi blue is created when a bi black Sheltie meets a merle modifier. It's fairly unusual to see, although careful Sheltie breeders can manipulate their odds of producing bi blues by having a handle on the underlying genetics. They are healthy dogs, possessing only one merle gene, as opposed to two merle genes which creates the blind double merle. Judges look for clear, silvery blue colors which are marbled with black. There's no penalty for the absense of tan markings in bi blue Shelties. The general look should be blue, however, and heavy black markings or rusty effects are considered faults. White factored Shelties have an abundant amount of pure white fur on their collar, chest and legs. More often than not, they have a strong white stifle running up the back leg which connects with the white on the belly. Aside from this distinction, they can be any of the usual coat colors of sable, black or blue merle. This Sheltie color comes from a modifying gene, as opposed to a base color gene. Like the merle gene, it can also produce blue eyes. White factored Shelties are valuable to some breeders as a way of producing sufficient white markings in Sheltie puppies. When two white factored Shelties are bred together, you get the remarkable result of a color headed white (see below) which may strike you as a double merle but is completely healthy. White factoring is welcomed as long as it doesn't exceed 50 percent of the overall coat or show up as conspicuous white body spots. In fact, white factoring is often seen in champions. The color headed white Sheltie - or CHW - is rare to see. 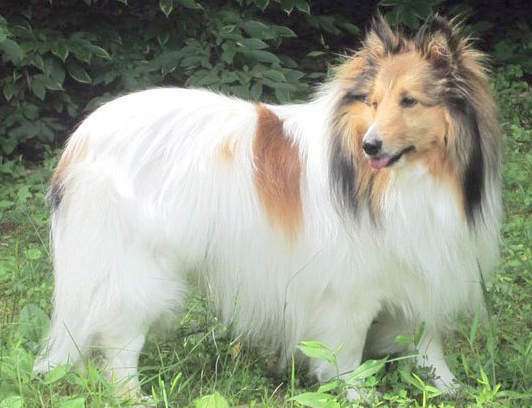 As the name suggests, the coat is virtually all-white, except for the head markings which are like any of the Sheltie colors described above. CHWs look like regular Shelties who've been dipped in white paint from the neck down and are fascinating for Sheltie fans to discover. Unlike double merles, color headed white Shelties have no hearing or vision defects. They're perfectly healthy dogs, often with no merle genes at all. The color is created by breeding two white factored Shelties together, which gives a 1 in 4 chance of producing a CHW. Color headed whites formed part of the breed standard until 1952. Nowadays when a Sheltie coat has more than 50 percent white markings, he's automatically disqualified from conformation. However, some breeders continue to create color headed whites in the hope they might one day be reintroduced to the standard. Thanks for checking out our Sheltie colors. If you enjoyed this article please share it with your dog-loving friends!